Xbox 360 patch will follow very soon. If you've been following the Grand Theft Auto Online saga, then you know there have been one or two problems with its launch. Lo, the call went forth: a patch is here! But it didn't quite do the business. Now another PS3 patch is here - the Xbox 360 version will follow within a day - and this one will solve many of the ongoing Online issues. Fixes multiple issues causing character deletion or other loss of progress. Fixes issues causing infinite loading, infinite sky cams, and missing interface options between jobs. Fixes an issue causing the "replay" option to be locked out on certain jobs. Fixes an issue where a player would become stuck in the mod garage when respraying a Sanchez motor bike. Fixes an issue causing the loss of guns and ammo. 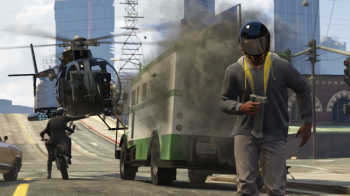 Fixes issues causing GTA races ending early because of players spawning too far ahead. Fixes issues in Last Team Standing where sessions would not progress past the lobby. Fixes issues with network errors when joining Last Team Standing using Quick Job. Added clarifications around when a player is using a temporary character in GTA Online during Rockstar Cloud server outages. Adjusts the monetary penalty for being killed in a One on One match. "We apologize for the problems some players have been experiencing with lost characters or game progress due to this issue," says Rockstar. "Please stay tuned for updates as we continue to investigate this." Rockstar also reminds you to save as often as you can, and pay attention to its support page for further updates.